Once every two years the Inductivist gets giddy with excitement when the new GSS comes out. As a first plunge into the new data, let's look at trends in confidence in the existence of God. 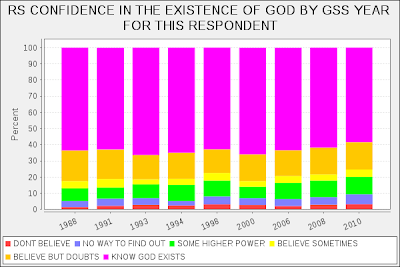 The shrinking purple section (if I were a girl, I'd know the precise name for that color) indicates that "knowing that God exists" has been on the decrease over the past decade. On the other hand, I wouldn't make any long-term predictions. Most of the experts sixty years ago predicted the imminent death of religion. As a follow-up to the last post, I calculated how warmly Hispanics of three different races (white, black, other) felt towards generic whites, blacks, and Hispanics (sample sizes = at least 200). Overall, Hispanics are the best liked group (not surprising); blacks are the least liked. This is the same pattern we saw in the last post with all races. White Hispanics like Hispanics better than they like whites. They like their Latinness more than their whiteness. People usually like their whatever-elseness more than being white if they have a choice. You distance yourself from whiteness if you can. Whites also like their own race the least (the difference is very big). I suspect that while they describe their race as white, many answer the closeness-to-whites question thinking of whites as "Anglos." Black Hispanics like blacks better than Hispanics. They like their blackness more than their Latinness. Black trumps Latino in the race/ethnic hierarchy. Other-race Hispanics like whites more than blacks, but the means for both are low. They like Hispanics much more than either blacks or whites. The 2.5 point gap between the mean closeness towards blacks and that towards Hispanics is huge. In debates over the roles of law and government in promoting the equality of income or in redistributing the fruits of capitalism, widely different motives are attributed to those who favor or oppose capitalism or income redistribution. According to one view, largely accepted in the academic social psychology literature (Jost et al. 2003), opposition to income redistribution and support for capitalism reflect an orientation toward social dominance, a desire to dominate other groups. According to another view that goes back at least to the nineteenth century origins of Marxism, anti-capitalism and a support for greater legal efforts to redistribute income reflect envy for the property of others and a frustration with one’s lot in a capitalist system. In this paper I expand and test the social dominance thesis using sixteen nationally representative General Social Surveys conducted by the National Opinion Research Center between 1980 and 2004. Because few questions of interest were asked in most years or of most respondents, the sample sizes used for analyses vary from 535 to 15,743. I first show that respondents who express traditionally racist views (on segregation, interracial marriage, and inborn racial abilities) tend to support greater income redistribution. Traditional racists also tend to oppose free-market capitalism and its consequences, wanting the government to guarantee jobs for everyone and fix prices, wages, and profits. Next, I report a similar pattern for those who express intolerance for unpopular groups on the fifteen Stouffer tolerance questions (regarding racists, homosexuals, communists, extreme militarists, and atheists). Those who express less tolerance for unpopular groups tend to favor income redistribution and oppose capitalism. Then I present the results of six full latent variable structural equation models. The latent variables traditional racism (Model 1: r=.27) and intolerance (Model 2: r=.31) predict the latent variable income redistribution. Similarly, the latent variables traditional racism (Model 3: r=.33) and intolerance (Model 4: r=.36) predict anti-capitalism. Controlling for education, income (log), gender, and age (Models 5 and 6), the effects of the racism and intolerance predictors on redistribution and intolerance are reduced, but remain significant. Thus the preference against income redistribution, for example, is not just the result of income or education - rather, the data are consistent with racism and intolerance continuing to play a small, but significant role in explaining the support for income redistribution and anti-capitalism. The data are broadly inconsistent with the standard belief in the social psychology literature that pro-capitalist and anti-redistributionist views are positively associated with racism. I then explore an alternative hypothesis, showing that, compared to anti-redistributionists, strong redistributionists have about two to three times higher odds of reporting that in the prior seven days they were angry, mad at someone, outraged, sad, lonely, and had trouble shaking the blues. 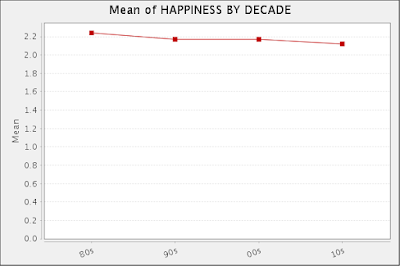 Similarly, anti-redistributionists had about two to four times higher odds of reporting being happy or at ease. Not only do redistributionists report more anger, but they report that their anger lasts longer. When asked about the last time they were angry, strong redistributionists were more than twice as likely as strong opponents of leveling to admit that they responded to their anger by plotting revenge. Last, both redistributionists and anti-capitalists expressed lower overall happiness, less happy marriages, and lower satisfaction with their financial situations and with their jobs or housework. Further, in the 2002 and 2004 General Social Surveys anti-redistributionists were generally more likely to report altruistic behavior. In particular, those who opposed more government redistribution of income were much more likely to donate money to charities, religious organizations, and political candidates. The one sort of altruistic behavior that the redistributionists were more likely to engage in was giving money to a homeless person on the street. Evidence from sixteen national representative samples from 1980 through 2004 tends to suggest that Social Dominance Orientation has been in part misconceived. In the United States, segments of the academic community seem to have reversed the relationship between pro-capitalism and income redistribution on the one hand, and racism and intolerance on the other. Those who support capitalism and oppose greater income redistribution tend to be better educated, to have higher family incomes, to be less traditionally racist, and to be less intolerant of unpopular groups. Those who oppose greater redistribution also tend to be more generous in donating to charities and more likely to engage in some other altruistic behavior. The academic assumption that anti-capitalism and opposition to income redistribution reflect an orientation toward social dominance seems unwarranted.